Who is afraid of IBS? Irritable bowel syndrome, also known as IBS, used to be a rare condition, but - due to industrialization and urbanization - it is now one of the most common disorders in the world. The term is even used figuratively, in a derogatory sense. The numbers of new reported cases of irritable bowel syndrome kept increasing into the 21st century when they reached almost epidemic proportions. As the amount of information available on the Internet exploded, so did the web searches about IBS. But then the disorder "came out of the closet", and google searches for "irritable bowel syndrome" started to dwindle, reaching a quarter of what they used to be at the peak. This downtrend mirrored ambulatory data (National Ambulatory Medical Care Survey and the National Hospital Ambulatory Medical Care Survey) showing that by 2010, the rate of IBS-related visits decreased roughly by 37%. Is IBS no longer a problem? From balloons inserted into stomach or colon to the dreaded colonoscopy, digestive diagnostic procedures are not fun. Tracking diet and symptoms, too, is tedious and frustrating - unless, like a mouse, you can be isolated in a chamber linked to analyzers that automatically measure everything for you. New noninvasive tests are emerging but adoption is slow. Medicare and most insurance plans won’t pay for a less invasive version of the conventional colonoscopy - CT colonography - as its lacks the sensitivity and specificity of the traditional test. Pill cameras for the detection of colorectal polyps and cancer are, too, still inferior to those of standard colonoscopy. 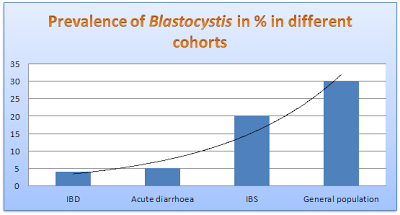 Besides, even though these tests are much faster and less invasive than conventional techniques, patients still need a cleansing preparation of their bowel prior to the test. In addition, the pill camera that usually exits the body after 10 hours, has to be surgically removed in 8% of the patients. And virtual colonoscopy leads to more “incidentalomas" and unnecessary treatments. A few novel endoscopic innovations also have uncertain clinical relevance. 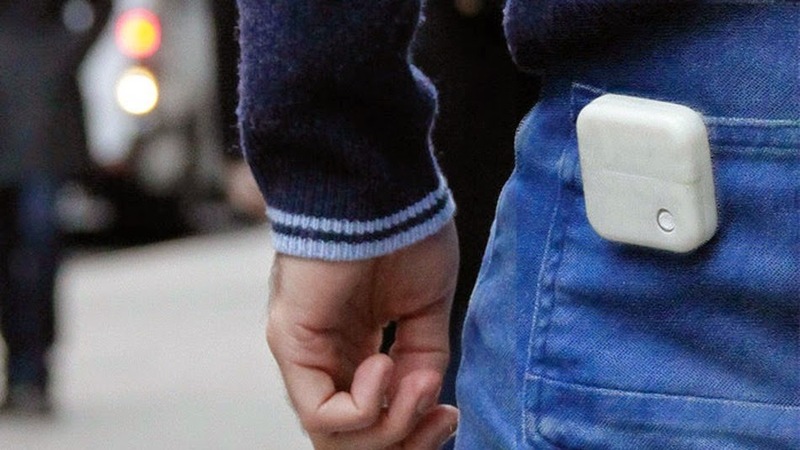 A simple wearable tracker of intestinal gas recently proposed by a Brazilian designer and telecommunications major does not seem to attract much interest in consumers. Perhaps it is because it offers too little information? After all, even the cow health tracker - Well Cow pill - measures not only the gas-forming potential of foods, but also pH and temperature within the digestive system to better monitor the healthiness of diet. Accurate measurement of intestinal gases could offer new insights into lives of human gut microbes and metabolic activities. Two novel techniques, in vitro fermentation and swallowable gas capsule systems, for measuring and assessing selected gas species, were recently proposed and could potentially be used for less invasive diagnostics of irritable bowel syndrome, inflammatory bowel disease, colon cancer, and other gastrointestinal conditions. 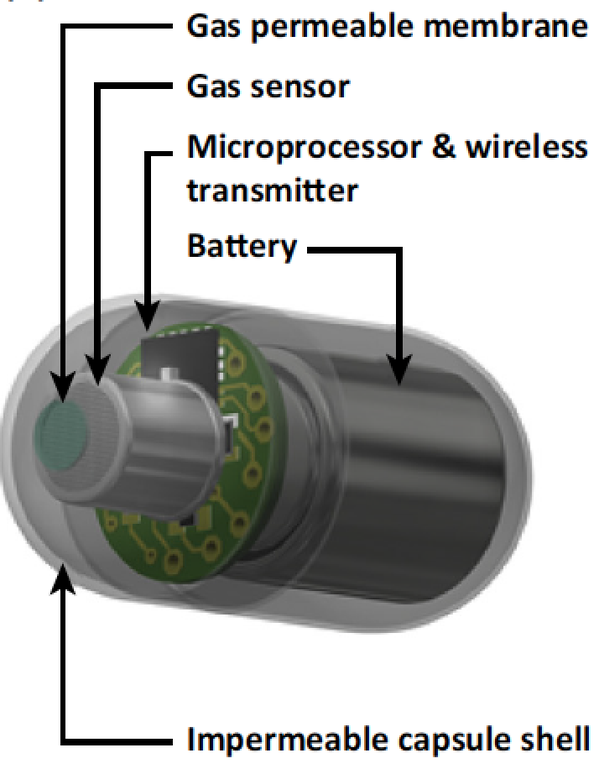 But could not we do better than popping gas sensor "pills" for easy every-day measurements of digestive health? We at Aurametrix think so. Stay tuned for more. 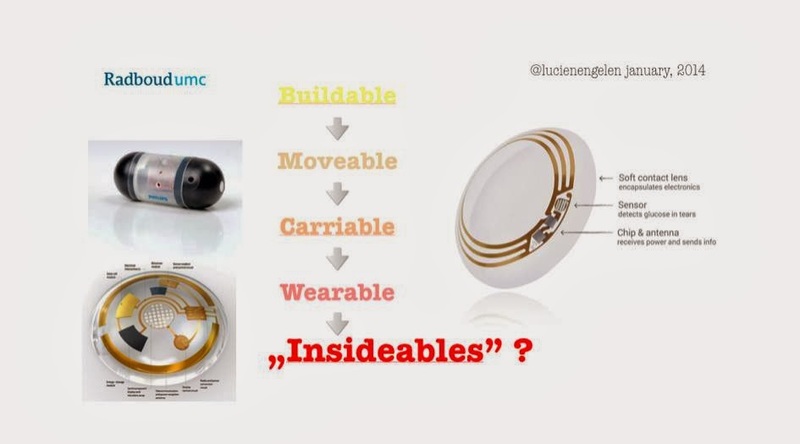 Next sensors will be in you, said a recent popular article. And some of them will monitor your digestive system. Accurate monitoring of digestion is hard. 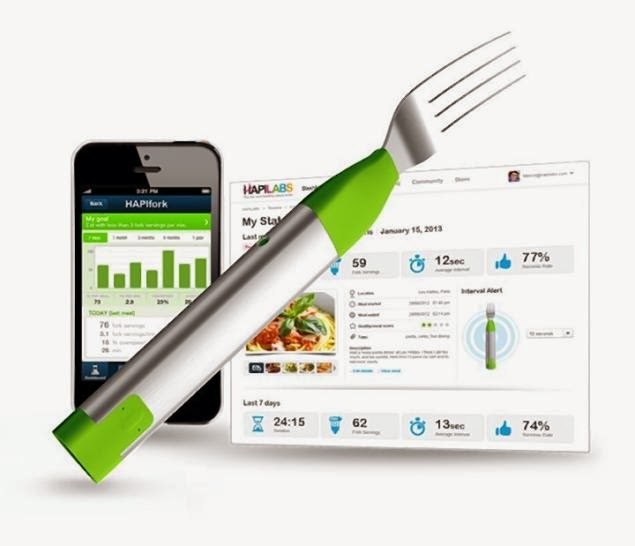 There are apps and high tech gadgets for that - like a fork that monitors eating speed or a watch that counts bites, but neither of them can provide a continuous and objective measures of what exactly is eaten and how it affects the digestive system. Thanks to wonders of modern technology, cows now have a device that can monitor the effects of food on their digestive system. 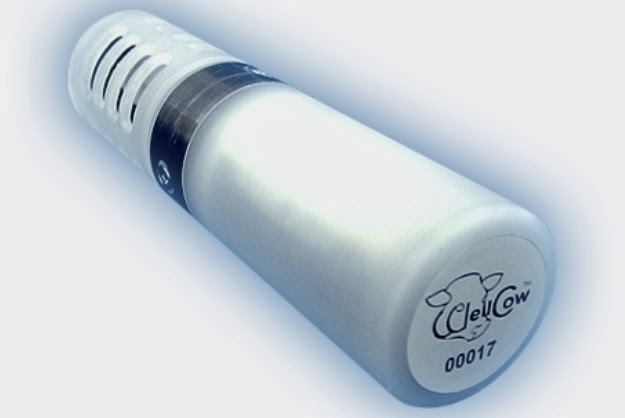 Well Cow bovine health monitor, an inch thick capsule almost as long as human hand, can be swallowed by a cow and measure the rumen pH and temperature within the digestive system every 15 minutes. It then transmits the data to a Bluetooth collar around the cow’s neck. This data can help to monitor the healthiness of cow's food intake, to predict its gas-forming potential in the short term, make sure it will lead to a high quality milk or prevent the development of health issues such as acidosis or infertility in the long term. The device can last between 80 to 100 days inside the cows. A smaller vitamin-sized device (1mm x 26mm with weight less than 4 grams) was recently approved for use in humans. This ingestible pill camera - PillCamSB - can monitor pressure, pH and temperature, gastrointestinal motility, lesions, ulcers, early signs of tumors and bleeding within the small bowel. FDA approved it for patients who have experienced an incomplete colonoscopy, as its lower-resolution-imaging can't completely replace the procedure. 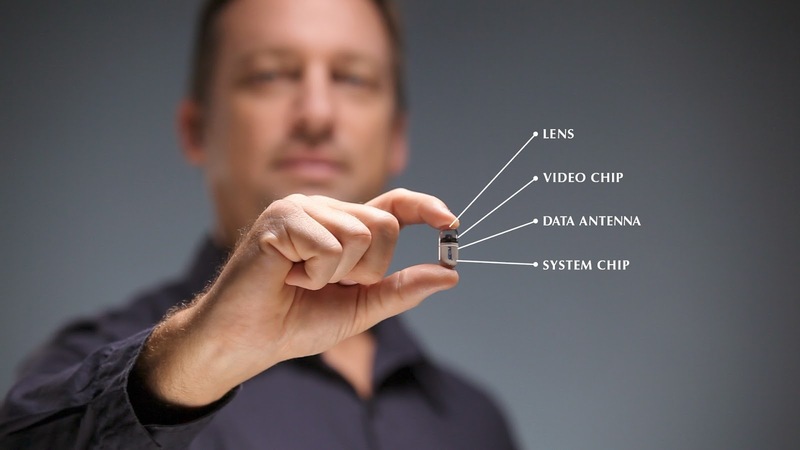 Food we eat and drugs we take can communicate from our insides too - Ingestible Event Maker sensor - size of a grain of sand - can be attached to any pill or a food item. Perhaps in the future we could rely on "insideables" to monitor our diet and automatically generate recommendations on what to eat and what to avoid? According to a song, The Future's So Bright Gotta Wear Shades. Wong WM, Bautista J, Dekel R, et al. Feasibility and tolerability of transnasal / per-oral placement of the wireless pH capsule vs. traditional 24-h oesophageal pH monitoring – a randomized trial. Aliment Pharmacol Ther. 2005; 21(2): 155-163. Hirono I, Richter JE. Practice Parameters Committee of the American College of Gastroenterology. ACG practice guidelines: esophageal reflux testing. Am J Gastroenterol. 2007; 102(3): 668-685. Teunissen LP, de Haan A, de Koning JJ, Daanen HA. Telemetry pill versus rectal and esophageal temperature during extreme rates of exercise-induced core temperature change. Physiol Meas. 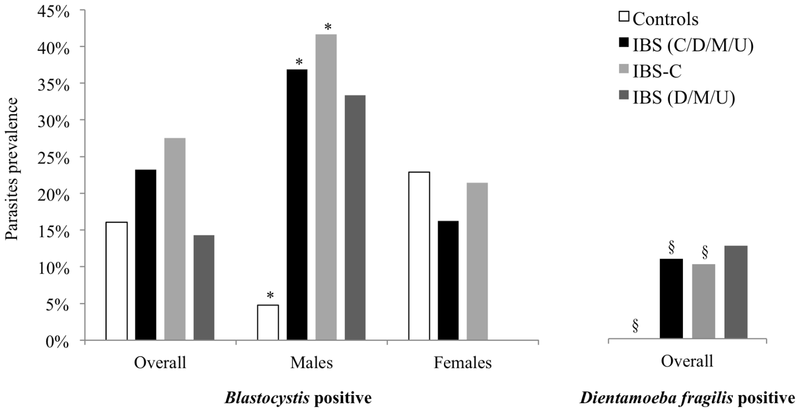 2012 Jun;33(6):915-24. doi: 10.1088/0967-3334/33/6/915. Epub 2012 May 3. The effects of IBS on quality of life may be more substantial than those of many other chronic diseases. It affects school, work and life, putting the sufferers at risk for social isolation. 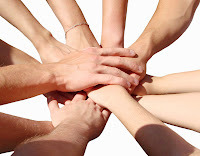 Numerous books, columns and blogs about this condition affirm that social problems arise because the sufferers are trying to hide the fact they have IBS from others. Keeping secrets is stressful, while being upfront and coming out of the closet is the best strategy. Is it really? Studies about emotional reactions towards people with chronic condition often lead to mixed results. For example, there was a slight increase in the readiness to feel pity to depressed people since the 90s, yet there was no increase in compassion. The most important consequence of TMAU - a metabolic disorder causing an offensive body odor - is social. This condition is not a subject of compassion, but rejection and ridicule resulting in low self-esteem, social ostracizing, anxiety and depression. Obese people (body mass index of 35 or higher - a condition that can't be hidden and kept in secret) are more likely to report day-to-day interpersonal discrimination and mistreatment. 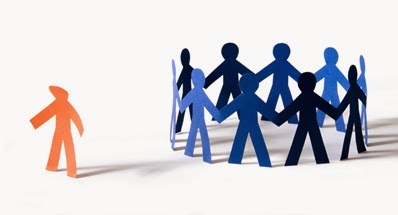 Recent study showed that weight discrimination makes people 2.5 times more obese after 4 years of discrimination instead of helping them to reduce their weight. People don't feel compassion as they consider obese individuals lazy, unsuccessful and weak-willed. Same can be applied to IBS. "The hardest thing is that other people who don’t have IBS can never understand what it is like”, says a sufferer in comments to an online article. People with IBS are often discriminated and the blows to self-esteem make it harder for them to make meaningful changes to their lifestyle, and to ease the symptoms. Compassion is a very valuable process that motivates sufferers as well as people around them to cooperate in achieving better outcomes. Professional education - based on visual arts and other methods - is often recommended in developing compassionate physicians, dietitians and nurses. But shouldn't we teach society as a whole to be non-judgemental, treating sufferers of chronic conditions with respect and compassion? And what should those with chronic illness do in the current society? Don't view your condition as a weakness and - when you need to tell others about it - keep it unemotional. People don't like sob stories, no matter how true or heartbreaking they are. Don't look for pity, impress them with your strength. Be able to tell the difference between a joke and bullying. Have a laugh with them and try to find better job environments and people that care.